"I'm a Librarian -- I looked it up." There comes a time when you have to make a choice about what you’re willing to take. For Los Angeles City employees who have been more than patient over months of contract negotiations, now is that time. Unfortunately, despite all of their best efforts at reaching an agreement, City negotiators are still refusing to settle a fair deal. Instead, they’ve been threatening painful takeaways and pay reductions. They are trying to force these workers -- who do a vast array of jobs in every department of the City -- to accept a new 10% employee contribution for health care premiums, while offering inadequate “raises” that in most cases will not even offset the new out of pocket costs.The actual amount that will cost these workers depends on their health plan, but this out of pocket cost could mean, for example, suddenly paying $160 more per month. AFSCME District Council 36 polling shows that many workers are barely making ends meet as it is. 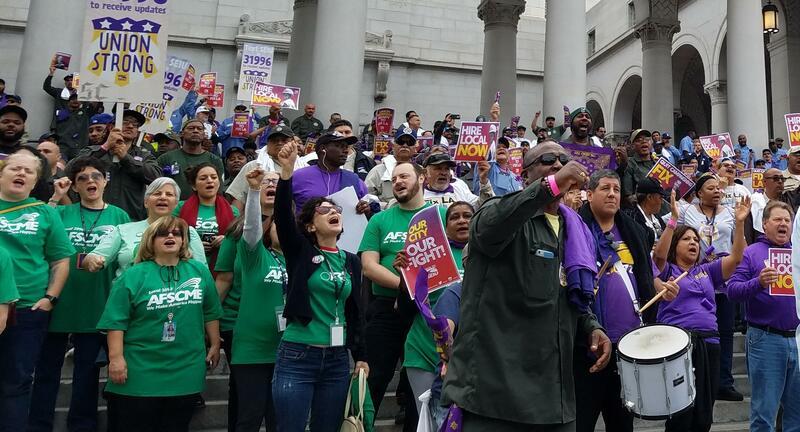 AFSCME's six LA CIty locals and the Coalition of LA City Unions have been pushing back hard at the bargaining table since negotiations began in the springtime. But the City seems to be digging in its heels. The workers do not believe it’s okay that Mayor Garcetti, who aspires to run for President in 2020, has been touring the states and touting “guaranteed health care for all,” even as his contract negotiators in the CAO’s office are weakening their health benefits and reducing their income. With City revenues up, and record budget reserves, there is no excuse for leaving City workers behind. As Henry Gambill, President of AFSCME Local 2626 (Librarians' Guild) quipped from the microphone at a rally outside City Hall, the City can afford to treat its workers right: "I'm a librarian -- I looked it up!" 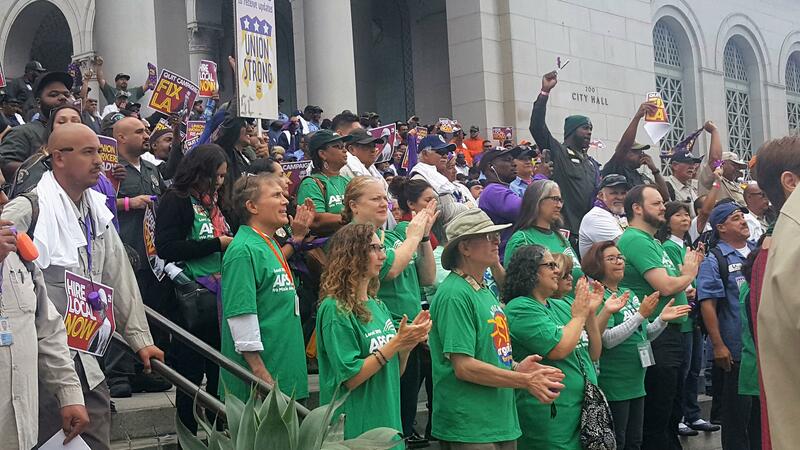 AFSCME and the Coalition of LA City Unions have been taking escalating job actions to reinforce the workers' position. In recent weeks, they have publicly called on the Mayor to keep his promises to restore services to residents and create 5,000 jobs that were cut in the recession; organized media events and staged rallies; and stormed City Council meetings. Last week, they held a massive “Our City, Our Fight” march around City Hall that was covered in the news. Mayor Garcetti, interviewed by reporters on camera, was clearly caught off guard by the show of labor unity and power. But will it be enough? The Coalition is watching closely and considering additional tactics to assure a contract victory.